From the co-author of "How Full is Your Bucket? For Kids," the book that started a conversation about the importance of positive interactions in schools and homes around the world, comes a timeless story about how to be healthy and create energy in our daily lives. Through a series of brief adventures, Poppy and Simon discover what it takes to recharge themselves and bring an entire village back to life. 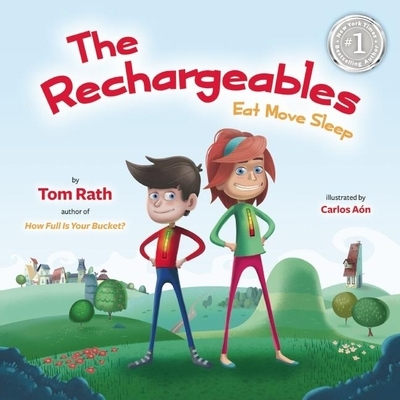 Based on the research and concepts in "Eat Move Sleep," Tom Rath's latest "New York Times "bestseller, "The Rechargeables" is about the way small choices have a profound impact on the quality of each day. Tom has written five international bestsellers over the past decade, starting with the #1 "New York Times" bestseller "How Full Is Your Bucket?" In 2013, his book "StrengthsFinder 2.0" was the top-selling book worldwide on Amazon.com. Tom's latest "New York Times" bestsellers are "Strengths Based Leadership," "Wellbeing," and "Eat Move Sleep." In total, his books have sold more than 5 million copies and have made more than 300 appearances on the "Wall Street Journal" bestseller list. In addition to his work as a researcher, writer, and speaker, Tom serves as a senior scientist and advisor to Gallup, where he previously spent thirteen years leading the organization's work on employee engagement, strengths, leadership, and well-being. Tom also served as vice chairman of the VHL cancer research organization. He holds degrees from the University of Michigan and the University of Pennsylvania, where he is now a guest lecturer. Tom, his wife, Ashley, and their two children live in Arlington, Virginia. Carlos Aon was born in Buenos Aires, Argentina in 1978. He studied in a comic book art academy and received a degree in Graphics Design. He is a co-founder of "La Productora," an independent comic book label. Carlos has worked on many story books and educational projects in the USA, Argentina, Spain and other countries. His latest works include "Bermuda Triangle," "The Lonely Existence of Comets and Asteroids," "Aliens and Energy," "Frankenstein's Monster," "The Scientific Method" and "Achis!"